Do you ever wish there was a process to follow to build online sales? I was recently training a group of entrepreneurs and they were daunted by the amount of work required to build an online business. It involves social media, blogging, social advertising, SEO, sales funnels and much more. And… why don’t we add live streaming to the mix – Periscope, Meercat, Blab, Firetalk, Nomadcast?! ….we decided to make this a lot easier for businesses by providing a framework you can follow to build your business online. You build influence online and then you build sales. Influence means building a relevant audience that listens to, and engages with, your content. The PRISM funnel is a structure to follow to build your influence online and then build sales. You have to produce content to be successful online. You create content on your website to attract your audience, you share tweets/messages to build awareness and drive traffic, you encourage user-generated content to promote your business and more. Without a clear, documented strategy, you will waste a lot of time and effort. 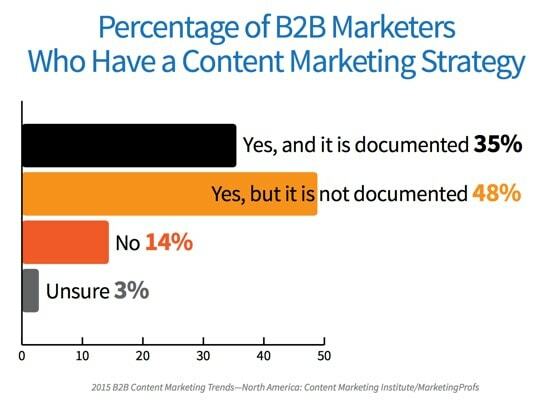 A recent report from the Content Marketing Institute in partnership with Marketing Profs showed that only 35% of B2B marketers have a documented content strategy. This research is directed more at larger organizations so I would expect that, for smaller businesses, this percentage is a lot lower. So, you need to start off with a documented plan for your content. You want to build processes online that are repeatable. You can then optimize your processes to improve them. You don’t just jump in and start something. Instead, build out your process, document and then implement it. Venture capitalist Ashu Garg predicts that marketers are going to spend 10 times more of their budget on marketing technology by 2025. I don’t think you are going to be too surprised by this. Technology is becoming an increasingly important part of our online marketing. 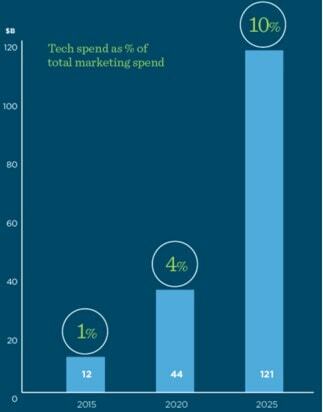 All marketers need to have technology skills and this requirement is going to continue to go up. To be effective in online marketing, you need the right marketing technology but, unfortunately, evaluating marketing tech is extremely complex and time consuming, so you need help. 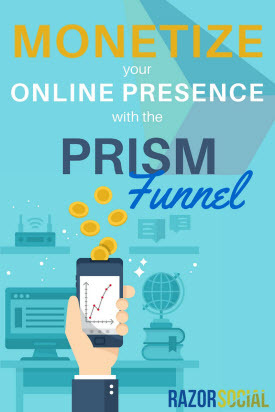 Your PRISM funnel is the steps you need to take to build your online sales. Let’s go through each stage. If people don’t know about your product or service, then you’ll have no chance of selling it. You have so many paid or unpaid opportunities to build your audience… you have to focus on what’s right for your business. The ‘be everywhere’ strategy is great in an ideal world but you have a business to run, so focusing on the most important channels is essential. There’s also a quick way and a slow way of building your audience. For example, if you create great content on Facebook, you’ll build your fans over time. If you target your website visitors with ads, you’ll build your audience a lot more quickly. You need to have a clearly defined plan to build that audience. a) You’ve built an audience on someone else’s platform and Facebook controls who sees your content. You need a strategy to get people from Facebook to your website. b) You’re not getting much engagement because you are sharing the wrong content or you have the wrong audience. When you don’t have engagement, how are you going to get people from Facebook to your website? How are you going to mobilize people into action when they don’t take action?! Imagine if you launched a new clothes shop and everyone in your town was talking about it. That’s fantastic but, unless they come into your shop, you won’t get sales. Social media is great for creating that conversation but the action happens on your website. There are also other tactics outside of social media for driving visitors to your website. This is great but you still need to build relationships. Cold traffic is when there is no relationship with the audience. You’ve done all the work to drive people to your website but over 70% of your website visitors will leave and never come back… So what are you going to do about it? Building email subscribers is about building your own community where you can build on or start relationships with your audience. It’s a far better medium for selling than social. But what happens with people who don’t subscribe via email? You need to follow them to other places on the web and bring them back. It’s too expensive not to do this! So, how do you sell to people who visit your website or sign up to your email list? You build out the sales funnels on your site. You work out the best way to bring people into your funnel, work out the paths through the funnel and the best ways of converting your prospective customers. Online marketing is complex but, if you follow a tried and trusted process, it will save you a lot of time and money. The PRISM funnel is one process you can use to building your online sales. What are your thoughts? We’d love to hear your feedback.